Former Special Agent Louis Skenderis is joining National Check and Currency as General Counsel. Louis comes to NCC from Homeland Security Investigations (HSI), the main investigatory arm of the U.S. Department of Homeland Security. 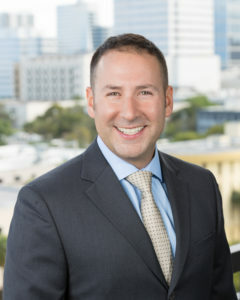 As an HSI special agent for over nine years, Louis gained comprehensive experience conducting criminal investigations involving money laundering, investment fraud, bank fraud, unlicensed and illegal money services businesses, and other offenses involving the Money Laundering Control Act, Bank Secrecy Act (BSA), and the USA PATRIOT Act. Before working as a special agent for HSI, Louis worked at the Financial Crimes Enforcement Network. Louis is a powerful addition to NCC’s MSB banking team, with diverse experience at FinCEN in both the criminal and the regulatory departments. This dual experience gives Louis unparalleled insight into what check cashers and MSBs need to do to prevent fraud, stay compliant, and operate efficiently. When Louis joined FinCEN, he worked for several years in the Office of Investigative Support alongside federal, state and international law enforcement and intelligence officials. His team worked strategically to exploit BSA data and uncover the activities of terrorist financing networks and other sophisticated global criminal organizations. Louis then transferred to the Regulatory Policy and Programs Division, where he drafted anti-money laundering regulations and composed administrative guidance to MSBs pertaining to the BSA. At FinCEN, Louis was also responsible for conducting legal sufficiency reviews of every law enforcement request to financial institutions under Section 314(a) of the USA PATRIOT Act. Louis’ peerless experience with both criminal investigations and the MSB regulatory regime will provide strong leadership for NCC. Louis holds a Bachelor of Science in Business Administration from Bucknell University and a law degree from Syracuse University College of Law. As General Counsel for NCC, Louis Skenderis will oversee operations to ensure that all financial activities are conducted in a compliant, lawful manner. Louis will also serve as a vital part of the new client acquisition team. In this role, Louis will guarantee that all banking customers presented by NCC are well capitalized and fully compliant with state and federal laws and regulations. Likewise, NCC’s check cashing customers will benefit from Louis’ insights into the money laundering trends within the industry, which he gained working on the prosecution of illicit check cashing operations and unlicensed MSBs. Louis’ extensive experience with money laundering regulation and prosecution is invaluable to NCC’s MSB customers as they develop workable and realistic anti-money laundering compliance solutions. NCC’s record of hiring experienced federal agents, who specialize in financial crime and regulation, shows their unwavering commitment to compliance and transparency. As the check cashing industry evolves, NCC is committed to staying ahead of the curve. NCC’s clients benefit from this forward-looking mindset and from the high caliber team at their disposal. In addition to real MSB bank accounts, NCC supports every client with strategic MSB services. These services are the icing on the cake for check cashing clients. NCC’s supported MSB services include Remote Deposit Capture (RDC), Automated Clearing House (ACH) deposits, wire transfer, armored cash delivery, advanced POS technology, and more. Join NCC as an MSB client or financial partner today and start reaping the benefits of compliant, profitable check cashing relationships.